London is a world city of culture, politics, media and science. Its economy is based on high-tech firms and the service sector, encompassing a diverse range of creative industries, research facilities, media corporations and convention venues. London serves as a continental hub for air and rail traffic and has a highly complex public transportation network. The metropolis is a popular tourist destination. Significant industries also include IT, pharmaceuticals, biomedical engineering, clean tech, biotechnology, construction and electronics. It is home to world orchestras, museums, renowned universities, entertainment venues and is host to many sporting events. Its urban setting has made it a sought-after location for international film productions. Meet highly qualified and experienced Scientists from around the world researching on Bioenergy; this is your single best opportunity to reach the largest assemblage of participants from all over the world. Conduct demonstrations, distribute knowledge meet with highly qualified scientists, discuss new researches, and receive name recognition at this 2-day event. World-renowned speakers, the most recent techniques, tactics, and the newest updates in Biofuels and Bioenergy are hallmarks of this conference. Be Part of it! This conference focusing on all the major aspects in the field of Bioenergy It would be beneficial for all the students who ever willing to enter into corporate as well as research fields targeting to the respective field. Chance to form alliance with emerging or established companies/ Research institutes in the respective field. The demand for renewable energy is growing enormously. From the evidence available today, we believe that biofuels could, with developments in technology and favorable policy constitute up to 30% of the world transport fuel mix by 2030. The advantages of bioenergy – whether in greenhouse gas benefits, energy security or rural development-mean that many governments are keen to foster the industry through current phases of technology development to deliver material scale and reduced costs. Our belief is that the industry can be developed sustainably, provided appropriate feedstock’s are grown, which do not adversely compete with food, using good land management to minimize environmental impact. This will require development of appropriate sustainability standards; it will not be easy, but by engaging in the industry, responsible businesses will work out appropriate business models and want to see enforcement of standards across the industry. This paper sets out the characteristics of the global fuels market, the significance of joint industry studies with car manufacturers and the choices around land use that society must make. The approach taken by BP is then described whereby guiding principles have been defined to set the boundaries of our impact on ecosystems. 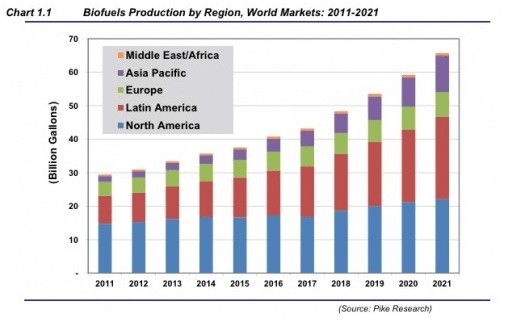 Characteristics of the biofuels market: its size and growth rate, the world is in a state of biofuels fever. 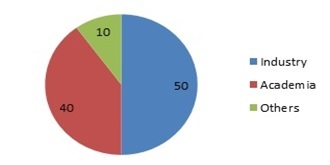 In 2006 biofuel constituted 49 bnlitres, Or 3%, of the 1,600 billion litre market for gasoline and diesel fuel. By 2015 the biofuels market is likely to have tripled to 155 billion litres. In practical terms that is an increase of around 10 billion litres per year over ten years. In terms of current ethanol yields of 5,250ltrs / ha, this equates to an increase of land use for biofuels of approximately 17,000 square km per year. The bulk of the global demand for ethanol and biodiesel comes from a few major regions. The USA accounted for very nearly 50% of global ethanol consumption in 2006, with Brazil taking 36% of global volumes.